OK, remember that thing I said about us not being “ruins people”? I take that back. 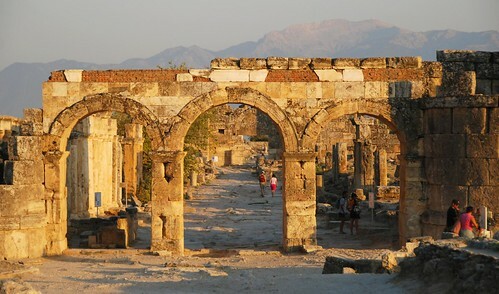 It turns out that we’re just not “Ephesus people.” In my last post, I alluded to the fact that we don’t really get excited by ruins unless there’s an incredible landscape to go along with it…and the reason why we know that to be true is because of our visit to Hierapolis and Pamukkale. 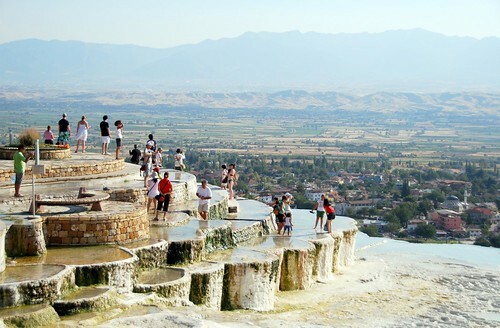 First things first: Hierapolis is another set of Greek ruins set in the hills above a site named Pamukkale. And what exactly is Pamukkale? 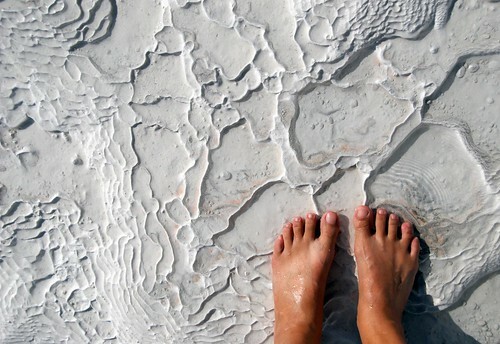 Only the coolest travertines (white limestone made of calcium carbonate) we’ve ever seen! OK, maybe the only travertines we’ve ever seen. It looks like snow but it’s really rock. 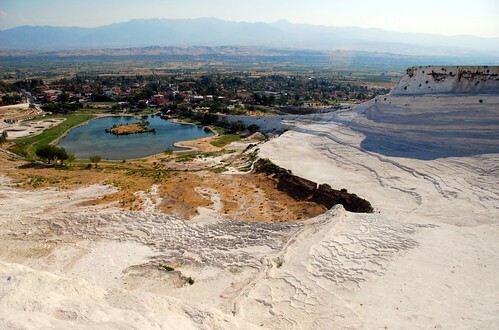 A bird’s eye view of the Pamukkale complex, with the town of Pamukkale in the background. Tourists in the travertine pools. J and I stuck to our usual M.O. and headed up to the Pamukkale/Hierapolis complex late in the afternoon, around 3PM. Unlike Ephesus, this time our plan worked—the huge crowds of Russian tourists in Speedos that flock to Pamukkale had already started filtering out of the complex, though a couple of them stuck around to pose for our photographs. In order to get to Hierapolis, you must walk through Pamukkale’s travertine pools (barefoot, which can be pretty tough on your dogs, unless you have tough Aussie feet). We couldn’t have timed our visit more perfectly! 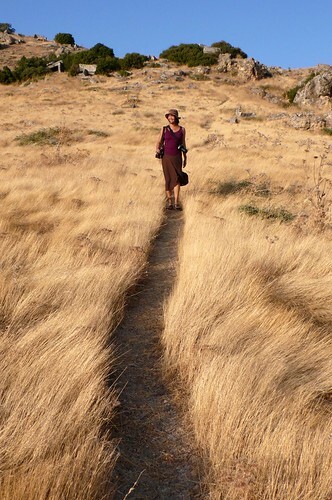 As we arrived in the Hierapolis area, the sun started going down, illuminating the dry grasses in the hills and creating the perfect golden light that plays a major role in every photographers’ wild, sordid fantasy. 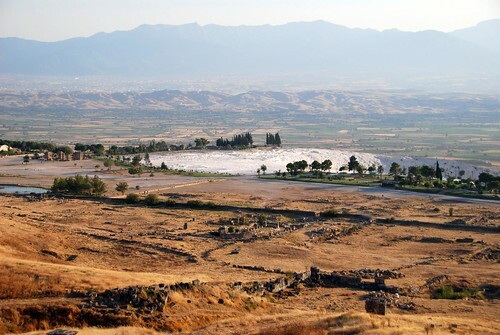 An interesting view of the travertines from the hills of Hierapolis. This time around, we had a fabulous experience exploring Hierapolis. We got to see the remnants of an old city, including their main ceremonial street and the men’s toilet. The Domitian Gate, entrance to the city of Hierapolis’ main ceremonial thoroughfare. 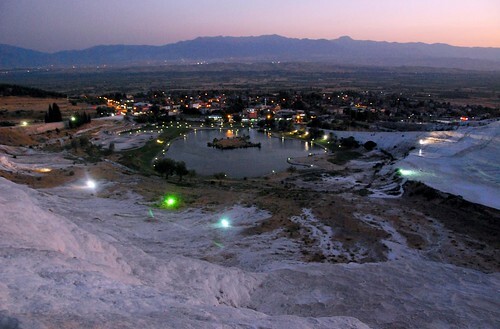 In fact, we were so entranced with Hierapolis’ HUGE ruins site that we almost missed the sunset! We scurried over to the travertine pools just in time to watch the sun dip below the horizon. 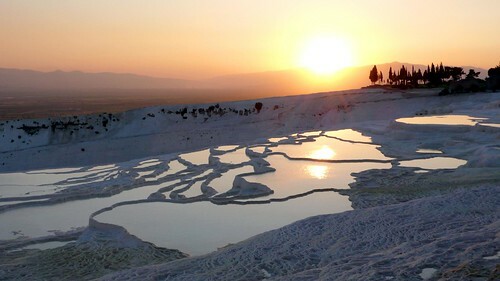 Sunset over Pamukkale’s travertine pools. We’ve seen a LOT of really, really gorgeous sunsets on this trip, and—dare I say it? The sunset we watched from Pamukkale might be the best one of the trip thus far. This vistas from the top of the travertines and the golden light shining reflecting off the pools…INCREDIBLE!!! It as so awesome that we were feeling sorry for all the Speedo’ed Russians who missed this stunningly beautiful sight. We’re sensitive like that. Since the sun had already gone down, we made our way back to town in the dark. But don’t worry—they light up the Pamukkale complex so you can still find your way down (though it was a rather painful descent with that rock). We almost didn’t come to Pamukkale—it is a heavily touristed site and after our experience with the crowds in Ephesus, we were worried that we would be turned off. But as is the case in most situations, timing here in Pamukkale is everything. How we got from Selcuk to Pamukkale: Paid 20 lira each for a “direct” bus from Selcuk to Pamukkale. And by “direct,” I mean we stopped in Denizli and changed to a minibus. We still haven’t quite figured out what “direct” in Turkey means…we’ve had “direct” buses that stop in every major town along the route and “direct” buses that make you transfer to a different bus. So as far as we can tell, as long as you work under the assumption that “direct” in Turkish means “indirect,” you won’t be disappointed. Where we stayed in Pamukkale: As in Ephesus, we went with the hotel touts at the bus station and ended up at a place hilariously called The Four Seasons, also known by its Turkish name, Dort Mevsim (I say hilarious because on the way to the hotel, the owner kept passing backpackers and asking, “Are you going to The Four Seasons?” And these backpackers would look at him like, “Our clothes are riddles with holes and I haven’t brushed my hair in a month. Do I LOOK like I’m going to The Four Seasons?” Of course, little did they realize that “The Four Seasons” was actually an unfortunately-named backpacker hostel. First of all, a note on the hotel touts: Turkish hotel touts are some of the most civilized we’ve ever met. They seem to have some sort of system, where each tout gets his turn to pitch the newly arrived travelers. No Vietnam-style crowding of the bus here! In Selcuk, the first guy who approached us named a price that was waaay too high for us. So he said, “meet my friend, he has a cheaper hotel for you.” Which is how we ended up at the Canberra Hotel. So gentlemanly! Anyway, back to Pamukkale: we originally wanted to stay at a place called Venus Pension. The owner of The Four Seasons offered us a free ride on the promise that if we didn’t like that hotel, we would check out his place next. Classy!!! When Venus Pension turned out to be way overpriced, we went over to The Four Seasons (which was directly across the street) and agreed to stay there for 40 lira per night (US$25). The rooms at the brightly-painted Dort Mevsim are very comfortable, and there is a nice pool (which we didn’t end up using) and a shady terrace where you eat breakfast. All in all, a great place, and if you book ahead online, it’s even cheaper!